Locals in southern Turkey's Antakya are alarmed by water orchids invading the Orontes River, which crosses through the city, and are asking authorities to find a solution for the invasive species. 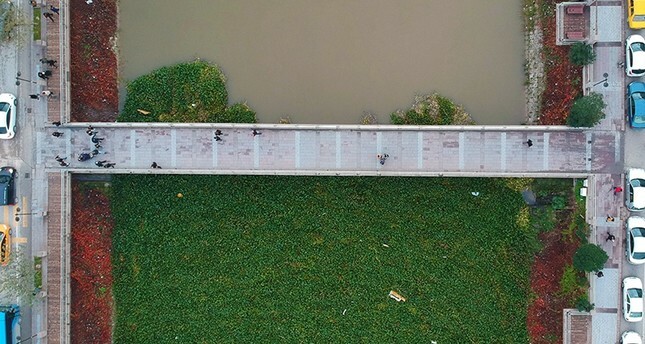 The river, also known by the name Asi, has been covered by water orchids for nearly a month and a half, despite clean-up efforts by the municipality using excavators and boats in an attempt to prevent their further spread. The orchids, believed to have originated in Syria and which cover parts of the river, have spread rapidly this year. Antakya local Ali Aşkar told the Ihlas News Agency that he walks by the river every morning. He has seen municipality units trying to clean up the water orchids, but this time the plants have multiplied to an unmanageable degree. Ömer Duranoğlu said that the river is looking very bad as people have thrown thrash onto the layer of orchids. Antakya Nature, Arts and Tourism Association Chairman Dr. Samim Kayıkçı told Anadolu Agency that water orchids, one of the most common invasive aquatic plants, originated in South America. "Wherever they spread, they cause problems in navigation and clog irrigation channels and turbine channels of hydroelectric plants. They also affect biodiversity of a region as they reproduce very rapidly and break the natural balance there," he said. Kayıkçı said the plants have some benefits, such as use in manufacturing of paper, rope and manure. Kayıkçı also noted that there is a risk of water orchids spreading to other rivers in Turkey. The orchids have also invaded some sections of the river in neighboring Defne and Samandağ districts. The 556-kilometer-long (345-mile-long) Orontes River rises from Lebanon's Beqaa Valley and flows through Syria, including through the major cities of Hama and Homs, before crossing the Turkish border in southern Hatay province. The 98-kilometer (58-mile) section in Turkey flows through Antakya, also known as Antioch, before flowing into the Mediterranean.